Written for Coursera (MOOC) Class ‘Global Sustainable Energy, Past, Present and Future‘ by University of Florida (June 2013). Greenhouse gas emissions have caused atmospheric concentrations to rise to unprecedented levels. Consumption of fossil fuels at an extremely high rate during industrialisation is the cause of this environmental shift. It has destablised the natural processes which maintain balance in the environment. Some of the consequences of this change include: predominantly higher temperatures, melting ice sheets and glaciers, sea level rise and more frequent extreme weather events. These all affect life on earth and alter the ecosystems which support it. In terms of direct human impact, low lying coastal regions are under threat, including major cities like Miami, New York and London, as well as many small island groups such as Tuvalu and the Marshall Islands. The perpetrators of climate change and the subsequent degradation of habitats, human and other, are not always on the receiving end of the worst effects. Furthermore, the direct link between GHG emission at source and climatic event has been difficult to quantify, until very recently. Protection of the environment is only now being enshrined in law in a meaningful way, by creating economic mechanisms for compensation. However, as these measures bed in and are refined, how well will the tariffs match the needs? In his book ‘Sustainable Energy Without the Hot Air’, Professor David MacKay provides some startling graphs illustrating these emission sources. Regional GHG emissions in 2000. 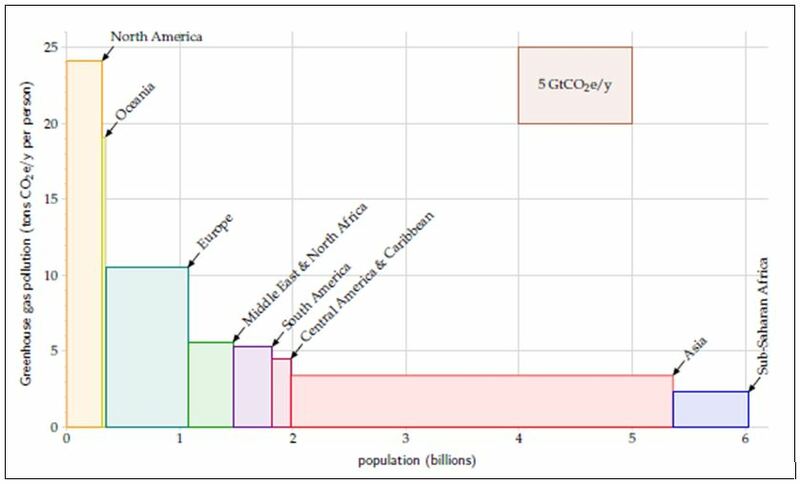 Each coloured box defined by population against per capita GHG emissions, gives the national emissions total. National GHG emissions. Here the regional blocks are broken out at national level. Although some Middle East countries top the per capita table, the relatively small populations mean that in global terms their emissions are less significant. Viewing emissions on an individual basis though, where we take responsibility for our own contribution and being accountable for our environmental impact, Qataris and Kuwaitis have some work to do. Since the cumulative emissions from decades and even centuries ago persist and affect global warming, should those who have polluted massively in the past be held to account, and contribute accordingly to adaptation funds? 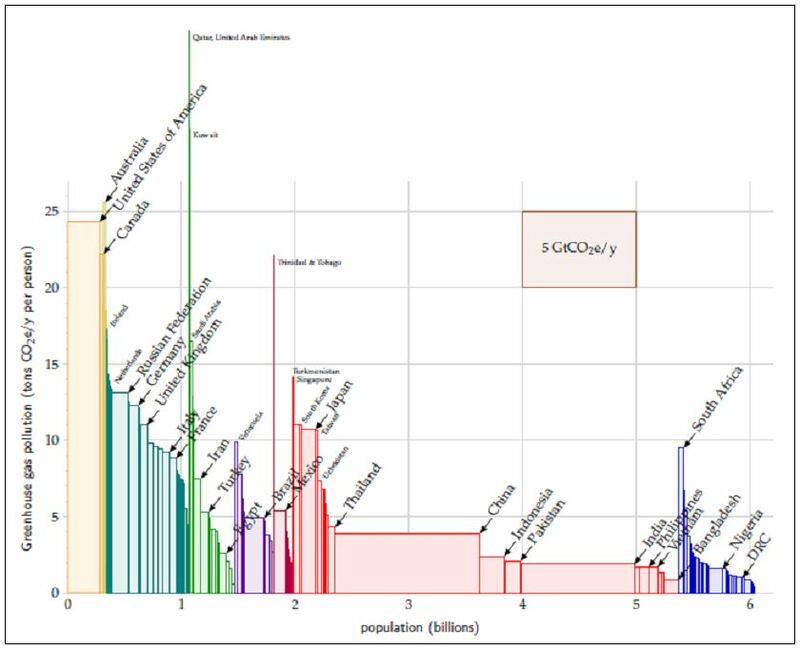 Professor MacKay’s graph of Historic GHG emissions highlights the contribution from early industrial powerhouses such as the UK and Germany, as well as the USA. It seems fair that some degree of compensation is paid for historic emissions which persist and contribute to current GHG levels.